This one sided machined aluminum mount allows mounting of the OKO "S" or "SH" series Red Dot Reflex sights to 1911's and clones, CZ 75/85, Tanfoglio, and and other similar pistols. The mount holes are un-drilled, so you can drill it to fit your mount hole spacings. 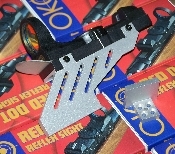 This mount is not designed to be used with Weaver mount or dovetail mount OKO sights. The mount also comes with a thumb rest that you can mount however you like.